Chris Pavey to Kent Hovind – N.I.M.B.Y.! – Kent Hovind v. Robert Baty – The Great Debates! Home→Chris Pavey to Kent Hovind – N.I.M.B.Y.! I live in the area that you are seeking to purchase land for your new Dinosaur Adventure Land. As a potential neighbor to you, I have attempted to contact you by email asking you to call me that we may have conversation, yet you chose not to call me. Now sir, I wish to state that I am a Christian and fully support the ability of God’s people to bring Glory to his name and leading the lost to Christ as their personal savior. Having said that, I began to investigate who my new neigbor was going to be and boy was I in for a shock. Now, I am not casting the proverbial stone as I have many issues in my own closet, but as a man of God, which I am not, YOU have a DUTY to present yourself above the rest in service to God. You continuing to fight and keep the fray alive is a detriment to your ministry and is hurting the God that you serve. Your wife followed God’s commandment to her, by being submissive to you and doing as you told her to do. However, you failed her in God’s commandment to you by loving her as Christ loved the church. The Federal Government just doesn’t pick a minister out of the blue and say let’s get him for tax evasion. My father was a Pastor when he was alive, and my ex father-in-law has served God for 65 years as a a Pastor, and never once was investigated by the IRS. Yes, you may get the money together to buy your land and defeat the IRS by putting it in someone else’s name but then again maybe you won’t. I will pray for you Mr. Hovind and ask God to bless you and ask God to open your eyes to the truth. As I said, I fail him daily and feel compelled to tell you that the main purpose in our lives as Christians is go and teach those about Christ, not to argue or debate aspects that have no bearing whatsoever on whether a person accepts Christ as their Savior. 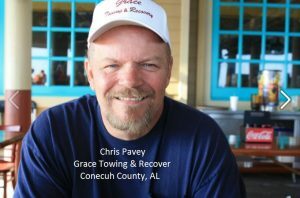 Chris Pavey eventually bought the land Kent Hovind was trying to buy and Kent was forced to consider other properties in Conecuh County. Kent eventually purchased approximately 145 acres a few miles from Chris’ place.